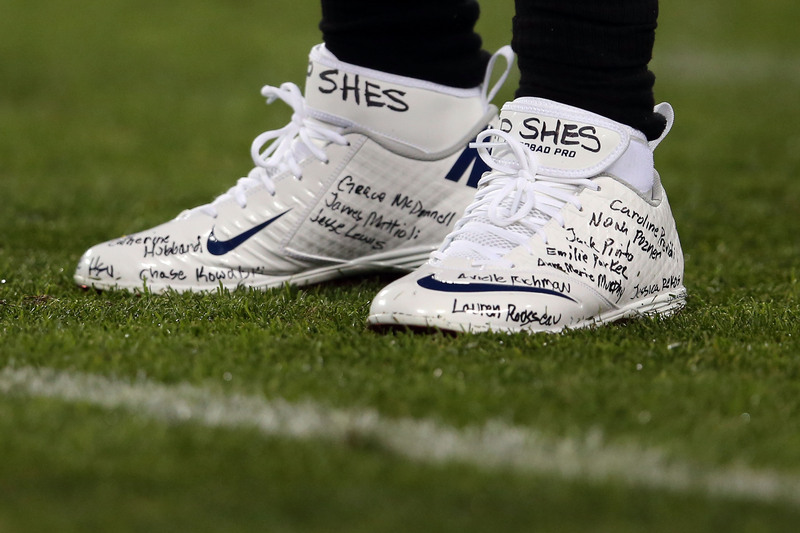 Before the Jets-Titans game Monday night, a moment of silence was held for victims of the shootings at Sandy Hook Elementary School in Newtown, Conn. Tennessee running back Chris Johnson made sure the tribute lasted throughout the entire game, writing the names of all the victims on the two shoes he wore for the game. He also had the words "R.I.P. SHES" and a cross written on each shoe. Johnson then proceeded to set a franchise record with a 94-yard touchdown run in the second quarter. "Kind of heartbroken, so just something to try to give back and show tribute to those families knowing how much they hurt and a situation where on Monday Night Football everybody around the world is watching," Johnson said about his tribute. The Jets had an "SHES" decal on their helmets. On Sunday, Giants receiver Victor Cruz also honored one of the young victims. After learning that he was the favorite player of one 6-year-old victim, wrote "R.I.P. Jack Pinto," "Jack Pinto, my hero" and "This one is for you" on his shoes for the Giants game against the Falcons in Atlanta. Twenty children and six adults were killed. The gunman also killed his mother in her home before committing suicide.